Looking for a House, Condo or Townhouse for sale in the Deep Cove area of North Vancouver? Deep Cove is the easternmost part of the North Shore, and includes the neighbourhoods of Dollarton, Parkgate, Indian Arm, and Woodlands. It is a fjord located at the entrance to Indian Arm and surrounded by lush rain forest on the slopes of Mount Seymour Provincial Park. Deep Cove Village is an attractive beachfront harbour with a charming retail centre. Once known as Deepwater, this was a popular summer resort for Vancouver residents in the 1910s, with cabins, logging and granite quarrying featuring in the local history. Today, the cove itself is home to a park and a marina, and is popular for its east exposure and great morning sun. Dollarton is the southeast-most extreme of the North Shore, touching on Indian Arm on one side and Burrard Inlet on the other, with Cates Park as the community showpiece. Dollarton is named for Robert Dollar, who bought 100 acres in 1916 to build a mill here, and the townsite here was built around his mill. Deep Cove was originally mainly cottages, but the population grew slowly in the 1960s and 1970s, when access to the area improved following the completion of the Second Narrows Bridge to Vancouver in 1960. Since then, the Deep Cove area has continued to grow. Residents still get a relaxed "vacation" feel in Deep Cove which seems to bring with it high prices and mostly upper-middle-income inhabitants. Real Estate prices for Deep Cove vary quite a bit because the area has a diverse collection of homes, from small cottages to contemporary and modern to full scale waterfront homes. Homeowners get seaside-community ambiance along with beautiful waterfront parks. Housing is usually in the form of older cottages, character homes and bungalows, some dating back 30 or 40 years. Newer construction tends to be for large senior-executive view properties and waterfront estates. There are four main neighbourhoods here: Deep Cove along the water, Cove Cliff overlooking Indian Arm, Dollarton nestled against Cates Park, and Indian Arm higher up on the hill closer to Mount Seymour. A select few homes on the waterfront, offer their own private moorage. Dollarton has many homes with views of the Burrard Inlet and the north shore of Burnaby, or across to Belcarra. Dollarton is a quiet neighbourhood with mostly single family homes with one townhome complex beside the golf course. There are several homes that have 100 foot wide waterfront lots with docks. Indian River is a fairly newly developed area on the eastern flank of Mount Seymour, along Indian River Road. Homes here have views of Indian Arm. There is a combination of single family homes, townhomes, and condos. Northlands has large, luxury family homes, built around the Northlands Golf Course, to the west. Please contact us to search for real estate in Deep Cove. The "Cove" as it is known, has Kayaking and canoeing school and rental, and has marina for small boats. The Deep Cove Bike Shop brought the first mountain bikes to Vancouver in the early 1980s, for outdoor enthusiast's to enjoy the area's forests, mountains and trails. The Baden Powell Trail starts here, leading up to the Quarry Rock lookout. Picnicking is popular in Panorama Park, with folks grabbing food from the local deli, pizzaria, or donut shop. Of course there is skiing (in winter) and mountain biking (in summer) on Mount Seymour. There is golfing at the public Seymour Golf Course and Northlands Golf Course, and more recreation activities are at Cates Park on the waterfront. Deep Cove is the perfect location for an active lifestyle, with boating, biking, hiking, two golf courses, and Mount Seymour all just minutes away! 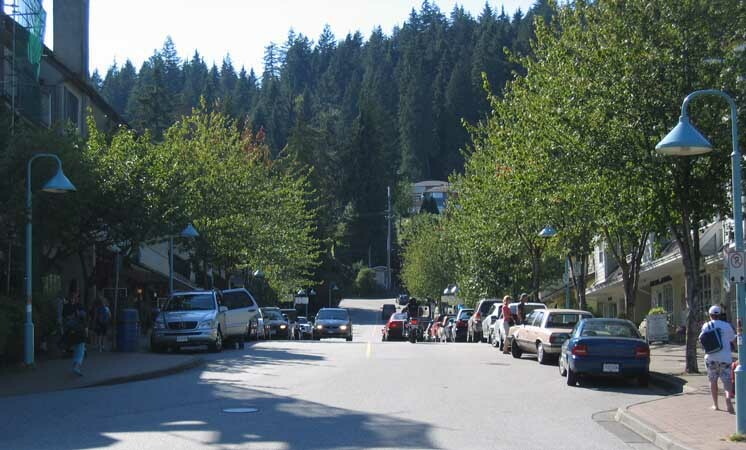 Gallant Avenue and Panorama Drive are the heart of shopping & dining in Deep Cove. There are a number of quaint stores, cafes, and restaurants in Deep Cove. The Dollarton Village Shopping Centre is about a kilometer away on Dollarton Highway. Up Mount Seymour Parkway from Dollarton Highway, you can grocery shop at the Parkgate Village Shopping Centre. The Parkgate Community Centre is a hub for community recreation and library. The area also has annual events like Deep Cove Daze, with festivals and music. Cates Park is home to various public events throughout the year. Deep Cove is served by Cove Cliff Elementary School, Sherwood Park Elementary and Seycove Secondary School, and students participating in the French immersion program attend nearby Argyle Secondary School or Dorothy Lynas Elementary School. Capilano University is a 10 minute drive away. The region is served by regular transit to and from downtown Vancouver and the rest of the North Shore. It is only 20 minutes to downtown Vancouver!